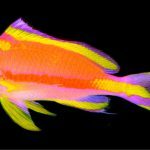 Plectranthias randalli, A Spectacular Rariphotic Perchlet Collected! 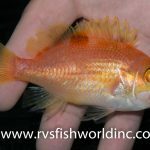 Home / Fish / Plectranthias randalli, A Spectacular Rariphotic Perchlet Collected! 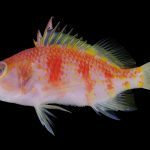 This beautiful orange-striped boi, known scientifically as Plectranthias randalli, was recently collected from the deep reefs of Taiwan by Yan Jiaxian of FormosaFish, and it might very well mark the first time that this species—a true holy grail among the perchlets—has made its way into the aquarium trade. This specimen has since traveled over to Japan—land of the rising sun and rare fishes—where it’ll be found for sale at Osaka’s AQuaStar. It’s rumored to be rather expensive, as you might imagine. Aside from it’s dashing good looks, there’s precious little known about Randall’s Perchlet. In fact, the species is so poorly known, it doesn’t actually have a common name, aside from the one I just made up for it there. The aforementioned Randall is of course none other than the illustrious ichthyologist John Randall, an authority on this group, who this fish was named for in 1980. The first specimen came from trawls at 300 meters near the Chesterfield Islands, located in the Coral Sea to the northwest of New Caledonia. Since then, P. randalli has been found once at a Sulawesi fish market and several times from Taiwan (where this aquarium specimen was apparently collected with handline). It’s noteworthy that the recent Okeanos ROV dives across the Central Pacific failed to find this species, which, together with the available records, suggest that this may be a West Pacific endemic. Plectranthias is a frustrating genus. As of late 2018, there are 63 species recognized as valid, with many other known unknowns still out there awaiting study. But it is widely understood that these species do not represent a single evolutionary lineage and are instead simply a convenient assemblage of superficially similar fishes. The genus belongs among the anthiadines, but it is essentially just a dumping ground for those species that don’t quite fit in elsewhere. 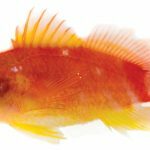 Nobody would confuse a Plectranthias perchlet for a Pseudanthias or an Odontanthias, but this is generally a poor way to define a creature. There is a tiny bit of genetic data (mitochondrial CO1) available for P. randalli, which provides some weak support for it forming a clade with Odontanthias and Caprodon, two of the other dominant anthiadine genera in rariphotic reef ecosystems. Also in this group is Plectranthias kelloggi, the perchlet that might be said to most closely resemble P. randalli in coloration and appearance. Both Odontanthias and Caprodon are active swimmers, especially the latter, while the two Plectranthias are largely benthic. Uploaded by Johora on 2015-04-15. The shift from a demersal lifestyle to a benthic one likely happened on several occasions among the anthiadines, but it’s anyone’s guess as to precisely how many times this shift occurred. Using this same mitochondrial barcode gene, we find evidence for at least four separate instances of “Plectranthias” emerging out of distantly related lineages. There are slender, elongated forms like P. ahiahiata. There’s the chunky P. japonicus. There are the shallow-water representatives like P. longimanus. Each of these seems to be an independent evolution of the benthic perchlet lifestyle. But there are many others in this genus whose origins remain less easily elucidated. 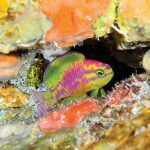 These enigmatic fishes are one of the great lingering mysteries of the reef… an ugly mess of beautiful species.